People Livestream This Guy's Face to be "Healed"
Forty eight year old Braco preaches no dogma. In fact, he doesn’t say anything at all. Nonetheless, he has thousands of devoted followers across the world. People say that staring into Braco’s unblinking eyes dispells physical and emotional suffering. 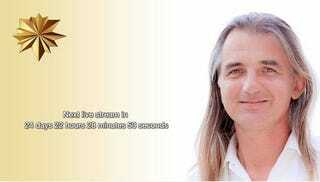 For the last 20 years, Braco has traveled the world to cast his healing stare upon his believers. But since the man can’t be everywhere at once, devotees have taken to organizing free-gazing livestreams, available to anyone over 18 (and, inexplicably, no more than three months pregnant) with an internet connection. Braco is a little goofy, but an altogether friendly-looking man with a hint of a smile. His shoulder-length hair is gray in places, white in others: a middle-aged Fabio ombré. His eyes are brown, his nose is round and prominent, and his brow is slightly furrowed. There’s a small mole just to the side of his left eye. He stares directly into the lens, blinking so infrequently that, when he eventually does, it’s downright startling. I don’t feel healed, exactly, but I do feel calm—sleepy, even. That said, I suspect that has less to do with Braco himself than my brain’s chemical response to a rare break from the endless clicking that usually characterizes the time I spend on the internet. It’s nice to intentionally do nothing. It’s not totally clear what Braco hopes to gain by generously offering up his much-coveted face for free. Wait, yes it is. These streams are helping to build a global audience that’s willing to shell out cold hard cash to attend a live event. And live events are the only place where you can purchase a yellow diamond-encrusted Golden Sun pendant — a rare and much-coveted treasure that offers a permanent “connection” to Braco’s energy. That’ll cost you six grand, so you better be sure it’s worth it. According to Braco’s website, another 13 days of free livestreaming will begin on September 19th.